Heron Island Reef (below) is a platform reef that is comprised of a range of habitats. Although these habitats are distinct, the transition between adjacent habitats is often subtle. Starting at the beach on Heron Island and walking south, a reef walker will first traverse beach rock and then move across the inner or sandy reef flat. As the walker makes his or her way to the reef crest the reef flat will be increasing populated by living coral. This is the outer or coral reef flat. Moving onto the crest, a reef walker will move over the rubble bank and come to the seaward platform, which will slope down to the reef slope. The reef slope drops to the sandy bottom of the inter-reefal channel that separates Heron Island and Wistari Reefs. Some species can be found in multiple habitats and others are restricted to one or a few. To the left is a list of habitats from which the marine invertebrates included in this survey are found. Hover over the habitat of interest to obtain images and a short description of that habitat. These descriptions are drawn from chapters "Geomorphology of a Coral Reef" by Peter Flood and "Reef Zonation" by Isobel Bennett in A Coral Reef Handbook (3rd Edition), edited by Patricia Mather and Isobel Bennett and published by Surrey Beatty & Sons Pty Ltd in 1993. 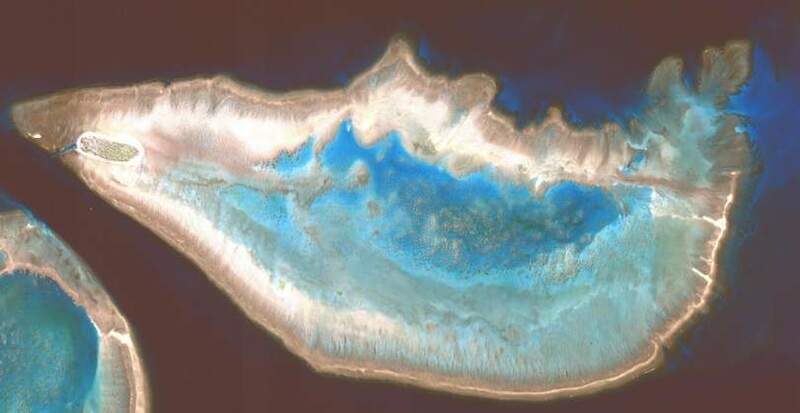 True colour satellite image of Heron Island Reef at low tide.